My family used to go regularly to a local strawberry farm every summer to pick our own strawberries. It’s a fairly common thing in the Uk but not so much in Perth. I had been on the hunt for a fruit picking activity to do with our Hike it Baby branch for a while and discovered that the PYO season for strawberries coincided perfectly with Giant Baby’s birthday. The review I read warned us that there was no shade and boy were they ever right. I’m really glad that we scheduled for as early as possible because the walk out of the strawberry fields was pretty toasty. Whilst we were hanging around waiting for another Hike it Baby family to turn up we were given some insider info: the best strawberries are the furthest from the entry point. No big ddeal, we’re Hike it Baby and walking is what we do! We walked for probably about 1km to get into the strawberries fields and then a bit further to get to the ‘good bits’. Mini Monkey proceeded to eat his body weight in strawberries fresh from the bushes before being convinced to put some in the box (occasionally half eaten) for his friend. 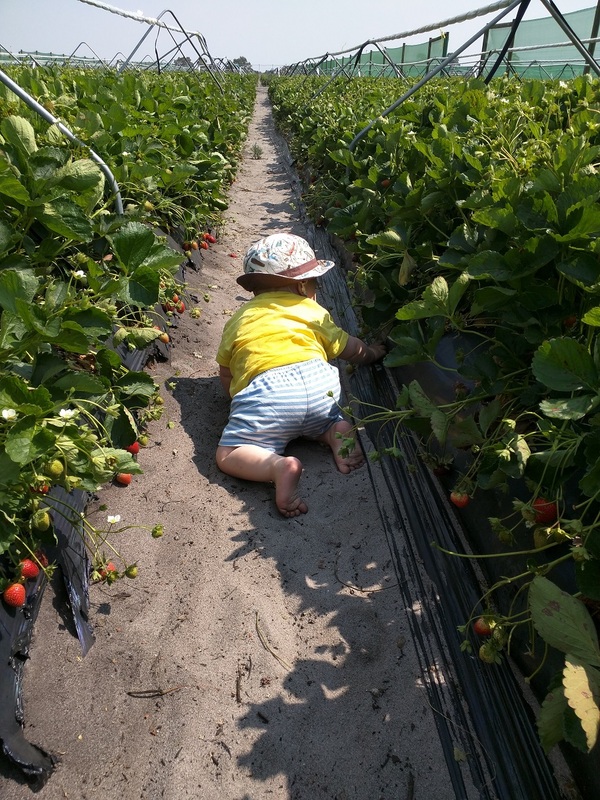 The Giant Baby got a little hot in the Tula and was getting fed up with me bending down to pick strawberries so I let him loose. The soil there is sandy and black so everyone ended up completely filthy. It was hilarious fun and I would definitely do it again. We collected about 5kg of delicious strawberries. Even after serving them at Giant Baby’s first birthday party in the afternoon and giving a whole bunch away to our friends it still looks like we have half a tray left. Ah well, here’s to a week of delicious strawberries! Opening Hours: 9am-5pm October/November to December. Exact dates depend ripeness of strawberries so keep an eye on their website or facebook page. Cost: $10 per 5kg tray (includes admittance for one person) plus $2 for additional people (including any kids who may walk/crawl and eat strawberries as they go). Max 5 people per group/tray.